In August there is no formal meeting of Colorado Columbine Chapter of ANG, but it certainly does not mean we are not stitching! Summer is a great time for picking new threads, canvases and treating ourselves to some relaxed day-long stitch sessions. 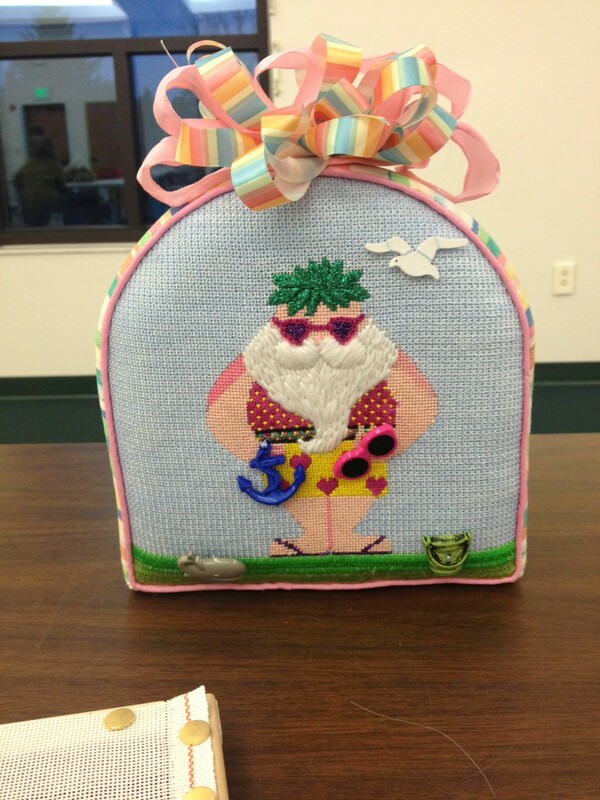 See Gloria M.’s fun seaside Santa in its finished standup form, above. We have new advertisers, so take a peek at the ADVERTISERS tab to see who’s new onboard. Stop by for framing & finishing help and shop for those oh-so-necessary new threads! These people support needlepoint and stitching in all its forms. They are all local businesses, easy to find. Best of all, there is instant gratification when you just need that special color or sparkle to finish a needlepoint canvas! In September, the program is TINY FRIENDSHIP GIFT BOXES! These adorable, glittery little squares are fast stitching. In October, we will learn how to assemble them and add pretty ribbons. They are so cute, one just may have to stitch all three… how about that for a stash buster? Join us in September to see what the fun is all about! Third Monday of each month except Aug & Dec.